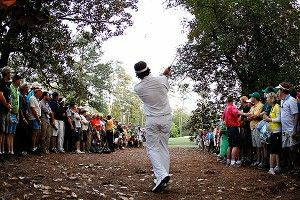 Bubba Watson shot a final round 68 and defeated Louis Oosthuizen on the second playoff hole with an excellent iron from the rough to win the Masters. He wept after he made the shot, which marks the first time in history that a “Bubba” has cried over something other than a raccoon getting into the fried chicken. He later chuckled about his tears, which was the first time a Bubba has laughed at something other than an old Hee Haw episode on Betamax. Oosthuizen hit a double eagle on the second hole Sunday — only the fourth time that feat has been accomplished at the Masters, and the first on television — and the fan who ended up with the ball, Wayne Mitchell, returned it to Augusta National. Neither side would discuss the terms of the deal they made, but it was curious that when Mitchell left the course, he was wearing a green jacket, and a furious Arnold Palmer was chained to a radiator in Butler Cabin. A crowd of 15,000 attended Easter services in Texas to hear Tim Tebow speak. When it turned out that there were only enough fish and loaves for about 100 people, Tebow miraculously created more, but then ruined everything when his attempt to throw them to the worshipers fell incomplete on the filthy ground. Kansas coach Bill Self told ESPN that Jayhawks junior Thomas Robinson will forgo his senior season and enter the NBA draft. An excited Robinson told reporters that he already has his new Kentucky hat ready for the podium in case they select him.